King Edward VII was a great ruler, yet even great rulers aren’t immune to the charms of cute little pet animals. 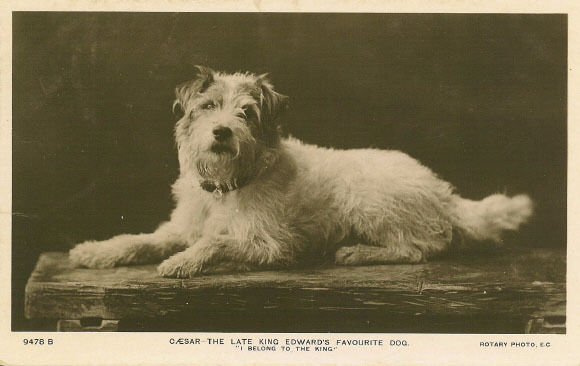 During his last years, King Edward VII was acquainted with a spirited wire fox terrier called Caesar. Very soon, the two of them would become best friends. The dog was given to King Edward VII by Lord Dudley in 1902 as a replacement for his dog Jack, who had died after choking on food. He came from the kennels of Kathleen, Duchess of Newcastle, a well-known conformation show judge, and dog breeder. It seems like the King didn’t care much about his mischiefs and smell (in fact he was amused by it). He was simply in love with the dog. Caesar was very loyal, and the two of them hardly separated. He followed the King everywhere; he was one of his traveling companions. Caesar slept on a comfortable chair right beside the King’s bed and even had his own servant tending for all of his needs. In case somebody didn’t know him, or in case he wandered somewhere unsafe, Caesar wore a collar with a gold tag that read “I am Caesar. I belong to the King”. According to accounts from the royal court, Caesar loved the King as much as the King loved him. When Edward appeared, he would always greet him with excitement. The King would ask him: “Do you like your old master, then?” and Caesar would respond by jumping all over the place. King Edward was affectionate towards animals, and he would never hit Caesar, though he occasionally shook his walking stick at him, calling him a “naughty dog!” Probably only when Caesar jumped on the throne. Caesar was quite a troublemaker; he frequently did things that caused problems for the King. Once, while the King was visiting Marienbad, a spa town in what is now the Czech Republic, Caesar started chasing a peacock and escaped. On another occasion, he probably felt peckish and killed some rabbits that were owned by Lord Redesdale’s daughters. No wonder the king thought Caeser was probably the reason why he couldn’t make some political agreements. Nevertheless, Edward was very fond of his dog and even asked his personal attendant, Lawrence Wrightson, to take care after Caesar in case he passed away before the dog. 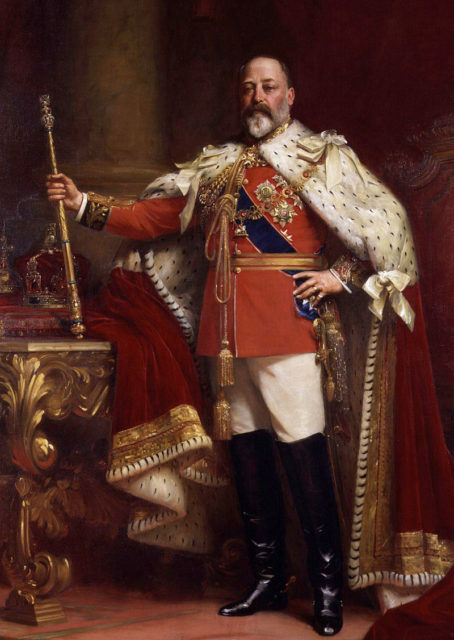 The inevitable came and King Edward the VII died on 6 May 1910. The death of the king struck him with sadness. He mourned in his own, dog-like way. He refused to eat and spend a long time whining in front of the king’s bedroom. Caesar even managed to sneak in the room once. Queen Alexandra found him hiding under the bed. He meant a lot to the King, and because of this, he was taken to attend the funeral. To the amazement of all the dignitaries and heads of state, Caesar led the funeral procession accompanied by a Highlander. He walked behind the carriage that carried the coffin. Caesar was walking ahead of all the kings in the procession. Apparently, Kaiser Wilhelm II of the German Empire was offended by this act. 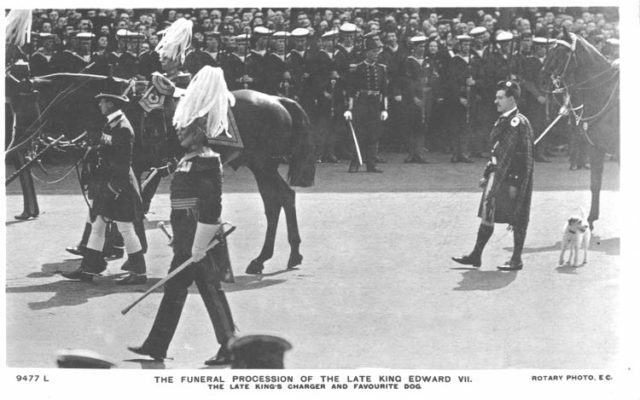 Caesar, accompanied by a Highlander, at the King’s funeral procession. After the death of his master, Queen Alexandra finally managed to convince him to eat again. Although she disliked the dog previously, the Queen grew fond of him. Caesar remained in the royal palace, and the Queen took a great care of him. She used to spoil him with all kinds of treats. On one occasion she said that the king didn’t treat him enough, so she had to compensate. 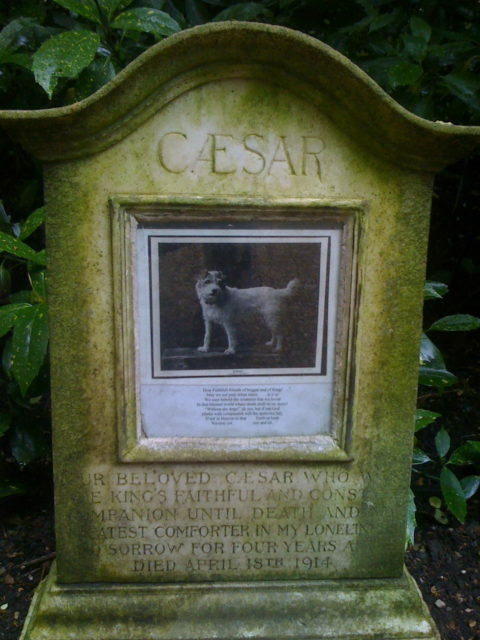 Caesar died in April 1914 after a complicated surgery. His sculpture was included atop of the King and Queen’s tomb in St George’s Chapel. He lies at the feet of the king. Caesar’s grave at Marlborough House. One month after the funeral, a book came out about Caesar’s life, titled Where’s Master? The book made Caesar widely popular. It was so successful that it had nine reprints just in the first year. The Steiff toy company even produced a stuffed toy based on Caesar’s image around 1910. Caesar’s story is just another one of the thousands of stories about the faithfulness and loyalty of an animal towards his owner. Everyone who has or once had a pet knows how strong their love can be.